As I mentioned in my recent Tokyo tips report, my trip was an opportunity to fly on Boeing’s newest aircraft, the Boeing 787 Dreamliner. I love the name, and have to say, I think it is accurate – this airplane is a dream. While every airline that flies the plane will have somewhat of a different configuration – with most carriers cramming as many seats in as possible – here are some reasons why the plane really is a game-changer. Humidity: Sounds boring, but the air on this plane is 3x as humid as a traditional aircraft. That’s because the plane uses more composite materials that don’t easily corrode due to the humidity. The result is that you don’t feel like your skin and nose/throat have been sandblasted by the desert-like air. Much much better. 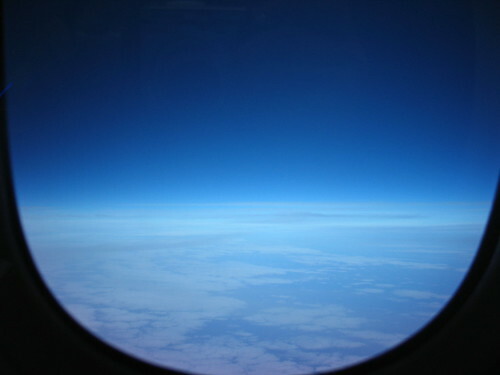 Altitude: Most cabins are pressurized to 8,000ft. That’s like being in Colorado at a ski resort way up on the top of the mountain. That’s why you get headaches, feel a little woozy at times, and exhausted when you get off the plane. 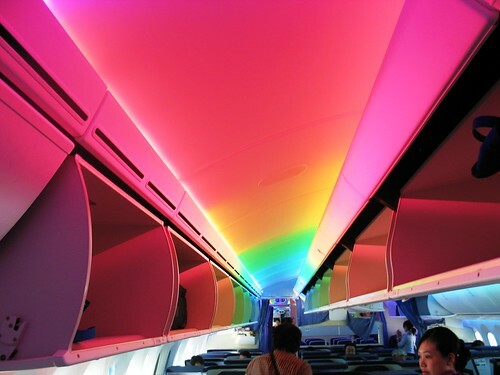 Dreamliner cabins are 6,000ft. That isn’t a huge drop, but it really makes a big difference in terms of comfort. Lighting: Dreamliner windows are a lot bigger than a traditional plane – I’m not sure if they’re twice as big, but close – and they have digital buttons that drop the window shade electronically into darker and darker shades of blue. It’s like magic – and great for sleeping and ensuring that sunlight doesn’t disrupt you. A handy item to help get one-up on the jet lag. The Dreamliner has a few features that you probably don’t care about quite as much as the airlines do. For example, the engines are designed with a unique scallop shape on the back which drops the noise quite considerably – it’s still “loud” on board, but much better. The planes are also supposedly able to deal with turbulence better, but it won’t quite disappear I’m afraid. Also, these planes are designed to get by far better fuel consumption – All Nippon Airways, the launch partner with Boeing, is showing massive improvement on their fuel costs on this plane, even more so than the engineers were planning. Hopefully this will translate into lower ticket costs, though if that becomes a reality remains to be seen. I have said that when this plane is in regular service, we will not understand why we had the older ones. It’s that big a comfort difference. Photo credits: markjhandel & Andy Hayes.